It generated a lot of interest. “The silver lining of an otherwise sordid episode: the almost visceral feeling of aversion and personal hostility between the two seems to have given way to a dignified and polite interaction. Way to go!” Haseeb Drabu, who skipped PDP’s crucial meeting the day Mehbooba staked the claim for the government formation, wrote. But the bonhomie that Kashmir’s two main political parties exhibited along with the “secular” Congress party was rare in recent history. A general perception is that it was aimed at ceasing power. But insiders in the entire process suggest the idea was blocking a process aimed at changing the broad contours of the political space and compromising the mandate that Kashmir historically had. The process was going on for weeks, soon after the PDP came out of the high voltage shock. The initial idea was that the local parties should shake hands and rule for the remaining two years, sidestepping the ‘big-brother syndrome’ for accommodating Jammu. Omar Abdullah was completely against the idea. 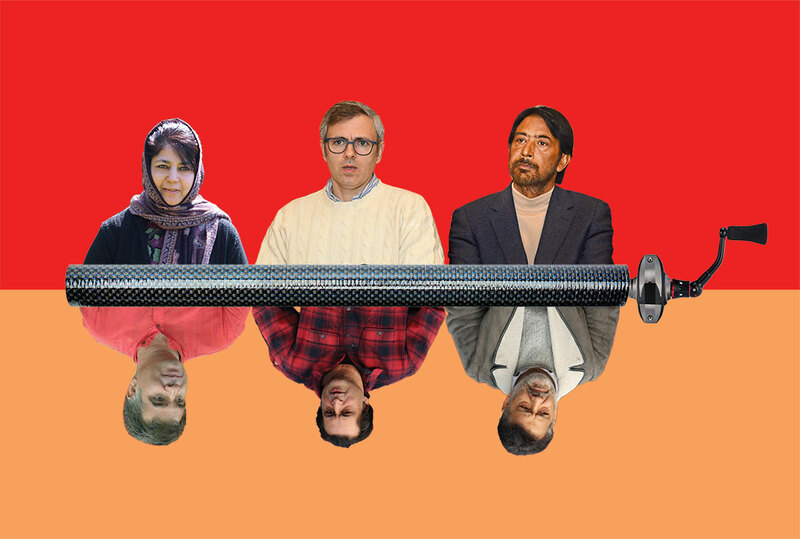 After the PDP followed the NC’s decision of staying away from urban local body polls, the go-betweens meeting somewhere near the Gogo, started getting increasingly together. The Mayoral election in which the BJP played a hyperactive role was the real game-changer. BJP ensured that the candidates under the influence of Congress, PDP and NC must support them and they supported. How they supported is in itself a long story towards which governor Satya Pal Malik referred when he said the “extensive horse trading” was going on. Ram Madhav, the co-author of the Agenda of Alliance and in-charge of Jammu and Kashmir flew from Delhi to attend a party function that Srinagar Mayor Junaid Azim Mattu hosted. There were prolonged discussions and photo-sessions. Later, an impression was let go that the next destination is the civil secretariat. 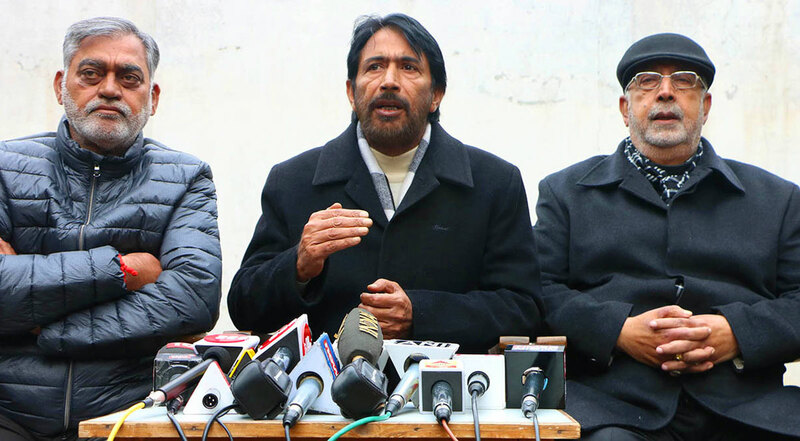 Sajad Lone announced at the press conference that the Third Front stands launched actually. In political circles, it is being termed as Northern Alliance. Between June and November, various lawmakers of the PDP had talked in multiple languages. Initially, Shia lawmaker Imran Raza Ansari moved out along with his uncle Abid Ansari. Soon, Mohammad Abbas joined them, later it was Javed Beg. Abdul Majid Padder also spoke about his “differences”. 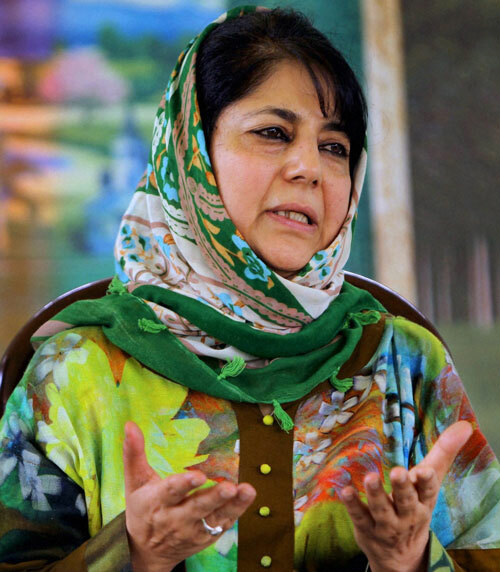 Though some of them later, mended fences but tensions at Fairview Guest House, the official residence of Mehbooba, remained. It was for the second time that the talk about “18 MLAs” was back in circulation. It had emerged for the first time when a mourning Mehbooba refused to succeed her father. The only difference was that the man who was then leading the dissidents was this time guarding against the defections. The larger plan, according to insiders was to have adequate numbers (44) for the government formation. It was aimed at creating a third political party, a perpetual ally of the BJP. This would operate initially in the north of Kashmir and leave the central Kashmir to NC and south to PDP. An earlier exercise during the Vajpayee era has already led to the rise of PDP which has, by now, emerged an alternative to the NC, according to NC veterans. 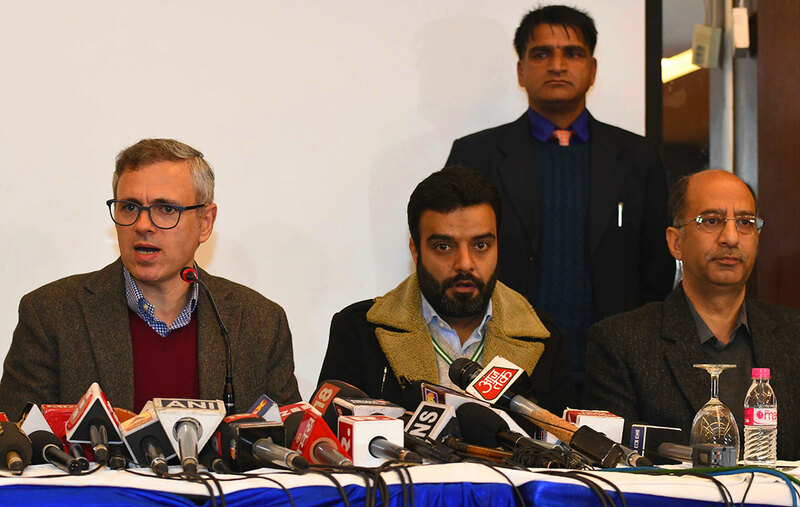 Omar Abdullah interacting with the press after the dissolution of assembly by Governor. In future, this proliferation would help divide the majority Kashmir vote amongst four players NC, Congress, Peoples Conference and independents, none of them would be in a position to emerge with a clear and major mandate from Kashmir. In Jammu, the consolidation of votes would help to create a bigger party. Thus the alliance will take place with the BJP supported the party and even if Jammu would not get the top berth, the Chief Minister will still have to rely on its main support base. The creation of supporting the Peoples’ Conference does not essentially require attracting new faces. It usually happens within the political class. In fact, Muzaffar Hussain Beig, Mohammad Akbar Lone, Molvi Iftikhar Hussain Ansari, Abdul Haq Khan, Nizammudin Bhat, and many politicians were part of the PC that Abdul Gani Lone once led. When PDP came into being, some of them joined it. A few like Molvi Ansari, Mohammad Rafi Mir, and Mohammad Dilawar Mir quit NC and joined Mufti. The realignment of political beings is frequent routine in Kashmir politics. There are various politicians who have been in almost all the political parties. Kashmir political class knows that traditionally power comes first and then legitimacy is negotiated. That was why the immediate affront to the traditional political class were the attempts at poaching for getting the magical 44. Finance and Home Ministers were also not in support of the idea, sources maintain. When governor Malik, reportedly, briefed Delhi about the activities of the BJP leaders in Srinagar and the reports he was getting about the use of the resource in the political class during urban polls, there was a shock. Some reports indicate that Kashmir ‘grand alliance’ would have suited BJP better but the dissolution was ordered for reasons of managing security front better. On November 21, 2018 afternoon, Omar Abdullah rang up Mehbooba and gave her go-ahead. This was in response to a piece of information that a claim was actually being made by Lone to form the government. Quickly, Syed Altaf Bukhari announced the ‘grand alliance’ to media at his residence. By 3 pm, sources said he had signed the support letter but wanted it to be sent only after NC Working Committee formally endorsed it, November 22, at 11 am. Congress had also agreed in principle. The letter did not land in Jammu Raj Bhawan that had its fax not working. Instantly, it landed on the social media. In quick succession, Sajad Lone, who flew from London, also staked claim, saying, apart from BJP, he has the support of 18 other lawmakers from other parties. He used WhatsApp to convey it to the Raj Bhawan. As the two claims came, the governor invoked his powers within the constitution and dissolved a dormant house. It put a halt the entire process of creating an alternative by using the readymade human resource. As the road to power got blocked, political parties retained their identity, as of now. The immediate dissolution of the House was a serious obstruction to a long process that is rooted in recent history. That day, the assembly was in session at Srinagar. The question hour was about to close as the Panthers Party lawmaker Harsh Dev Singh concluding his speech when three young men jumped into the floor from the public gallery. Carrying a flag and shouting slogans, it triggered a sort of a momentary crisis as lawmakers, initially, mistook them as Fidayeen. Unprecedented, the marshals reacted quickly and dragged them out. The transgressor trio was identified as Manish Khajuria, Sunny Malhotra and Ambedkar Gupta and they were carrying the flag of a J&K Democratic Front (JKDF), a new party that BJP leader Chaman Lal Gupta’s son Anil Gupta had founded. A BJP lawmaker Jagdish Raj Sapolia had driven the trio into the assembly, given them proper passes for the public gallery. The three young men told the police that they thought getting through the floor of the House was a better way of introducing the party! Then, BJP had 11 lawmakers in the House, the highest ever, but seven of them were facing party’s disciplinary action for supporting the ruling Congress and National Conference (NC) coalition in electing the members for legislative council on April 13, 2011. This led to their expulsion from the party. The assembly, however, avoided suspending these seven members under the anti-defection law as NC assumed the expulsion will help Congress improve psychologically and numerically in Jammu. But JKDF was not the outcome of some BJP men who were sitting idle, far away from the party. It was an idea that Sangh Privaar discussed before and after the 2008 land row. The frustration was that despite holding a lot of influence in a region, they still are at the periphery of politics with no political party willing to share any kind of power with them. Congress would not do so for the ideological reasons and neither of the two Kashmir based parties, the NC and the PDP, would do it for the same reason. The Parivaar seriously thought that they should give birth to a party that has local aspirations within the ideological fold but flexible enough to share power with other state parties. After the land, row improved the party’s tally to a historic high, and the cross-voting in 2010 led to the expulsion of the majority of them, the ‘rebels’ decided to implement the same idea. The party supposed to go to the people in the next assembly elections fell into dormancy as a new situation overtook its formal take off. After the September 2013 announcement about Narendra Modi being the party’s Prime Ministerial candidate, the activities accelerated. The first priority was to get its rebels back, everywhere. After the Jammu rebels wrote a letter to Rajnath Singh desiring to work for the party, five of the seven MLAs were welcomed back into the party. The phenomenon Modi changed politics across India and Jammu and Kashmir was no exception. With Prime Minister Modi personally flying across Jammu, the Parivaar’s pre-Nagpur capital, it has a massive impact on the ground. BJP took its record to a new historic high. It won 25 seats in an 87-member house and emerged the second largest political party of the state after PDP in Kashmir. What was interesting was the party’s impressive social engineering that led to the massive division of votes in Muslim majority Chenab Valley and consolidation of the minority electorate to make a smooth sail to the House. Sajad Lone, who had fielded his proxy candidates as early as 2002 in the assembly elections, contested the Lok Sabha 2014 unsuccessfully. Before jumping into the 2014 assembly elections, he had a detailed meeting with Modi. They did discuss the possibility of working together after the polls. 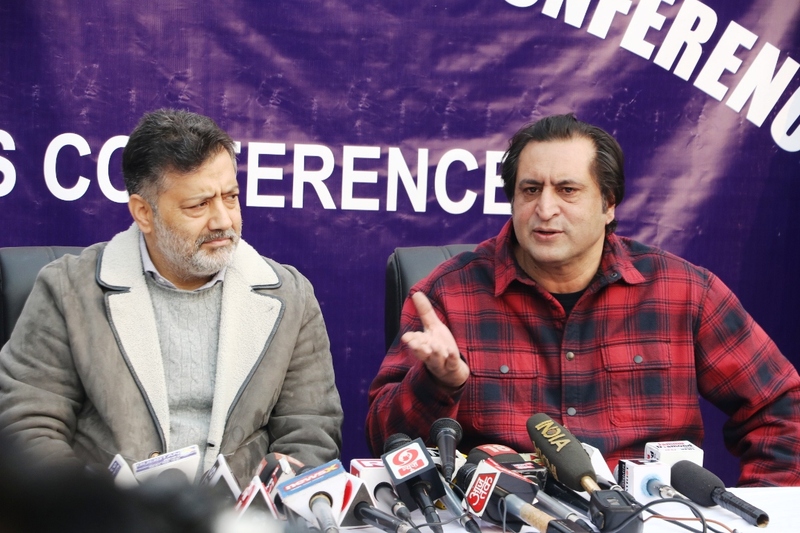 Sajad Lone and Imran Raza Ansari in a press conference in Srinagar. It was a literal pre-poll alliance, as subsequent developments proved. History was created in Jammu when Prime Minister Modi led a huge delegation of BJP to oversee Mufti Mohammad Sayeed taking over as the Chief Minister of Jammu and Kashmir with Dr Nirmal Singh as his Deputy. In a hung house, PDP emerged state’s largest political party but could not afford to ignore the BJP’s landslide mandate from Jammu. Sajad Lone, who rushed to sign the oath before actually taking it, was inducted as minister from BJP quota. But the historic day came to Parivaar after reconciling the part of what it was preaching since the Jana Sangh days. Mufti negotiated the Agenda of Alliance with an avowed objective to defend his turf and attempted “defang” the Sangh. Invoking Vajpayee doctrine, the BJP agreed to maintain the special constitution position of the state, encourage dialogue with all the stakeholders, take the cross-LoC engagement to next level, return some of the power projects that central PSUs own in the state and engage with Pakistan. The PDP, however, did accommodate the concerns of its ally and gave in on issues of West Pakistan refugees and some other things. The psychological barrier was crossed but costs were too much. On the very first day, when Mufti thanked Pakistan and militants for the smooth conduct of the assembly elections the Lok Sabha could barely work for many days. With the Swadeshi economics taken over by liberalisation much earlier, the BJP’s politics restricted to Kashmir and undoing ‘minority appeasement’. It triggered bad global media that impacted investments. Finally, the Parivaar took the non-governmental route to somehow revive its agenda. It managed a petition in the Supreme Court challenging the legality of one of the presidential orders that implemented Article 35A; it proved the biggest question mark over the justification and the wisdom of PDP founder. The particular law is crucial to retaining the ethnic identity of the state as its scrapping will permit anybody from across India to live and acquire non-movable property. Modi’s public rebuff to Mufti in Srinagar that he did not require anybody’s suggestion on Kashmir seriously dented the old man’s “maverick” status in Kashmir politics. Modi government blocked the Agenda of Alliance and implemented items that suited the BJP in Jammu. Even the relief for the affected population of the devastating 2014 floods was delayed, if not denied. This apparently was the key factor why Mehbooba Mufti was not keen to get into her father’s shoes after his demise. Eventually, however, she agreed to take oath after she was convinced that BJP was installing a government with the help of her party, even without her consent and participation. Soon, 2016 unrest broke out after popular Hizb-ul-Mujahideen commander Burhan Wani was killed in a gun battle. BJP ensured all support till the party’s reputation was dented by scores of body bags it sent to south Kashmir, its bastion. As a semblance of normalcy restored and the new age militancy broke out from Burhan’s funerals, BJP ranked up Pakistan involvement to the extent that PDP felt chocked at home. It sent a series of delegations to Delhi to convince the centre that attempts at 35A would burn Kashmir. Always, they got assurances but Delhi avoided making its stand clear in the courtroom. When Prime Minister Modi visited Kashmir in May, his team picked up something that, according to sources, led to the June decision of the BJPDP collapse. But nobody knows what it was. Another version suggested that Delhi was told that Mufti was resigning over the non-implementation of the Agenda and well before she could do it, BJP announced snapping of ties. BJP even avoided talking to its ally, and it was Raj Bhawan that communicated the decision when she was in a meeting on June 19. As her cabinet hurriedly moved out of the secretariat, there was a sought of traffic jam in Hari Singh High Street. Later, that day, when Mehbooba put in her papers, she avoided recommending dissolution of the assembly. State Congress Head, Ghulam Ahmad Mir along with senior party leaders. The initial idea in the PMO was to retain the old Kashmir hand N N Vohra as the governor. But some of his opinions were going against the Sangh thought process. He refused to take dictates for the August 15, speech in Srinagar and did his own speech. He appointed at least two advisors of his choice. Eventually, it reached a point that he himself sought to be relieved on health grounds. Finally, his successor Satya Pal Malik was flown from Patna on the day of Eid. The changeover came in such a situation that Malik and Vohra did neither find it comfortable to meet nor did they get an opportunity for a meeting. Governor Malik maintained from day one that he will not permit any horse-trading. But his frequent interviews broke the traditional silence of the Raj Bhawan and then he presided over the local body polls and the Panchayat elections (still underway) announced by his predecessor. The biggest outcome of the new process was unveiled on November 6, when NC deserter Junaid Azim Mattu was elected as Srinagar Mayor. The process to Mattu’s election was the real major reason why NC, PDP and Congress were forced to get into a common minimum programme and stall a process of horse trading in which carrot played as big a role as stick did. Muzaffar Hussain Baig’s press conference on November 20, just accelerated the process. With 2-members of his own and 25 of BJP, Sajad could not conquer the secretariat. But people close to him insist that age is on his side. His alternative, Lone told in a news conference, is taking off as “more people are joining”. Even without any major effort, his stake to the power itself is a major achievement for him, one political analyst said. “The seeds for the creation of another party stand sown,” the analyst said. “It may take time but it will grow as politics does not make everybody irrelevant every time.” Sangh has its own ideas for taming Kashmir.